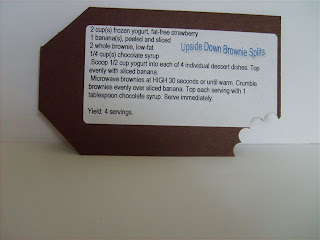 Recently I joined in a A-Z RECIPE Tag swap. I had never done a swap that involved recipes nor that I was given dimentions to follow. Due to my lateness of joining I got stuck with the letter U. U... now for a food recipe I kept thinking, this is going to be crazy... and then having to decorate it accordingly... COME ON! But I did.... I managed to decide that since the recipe had Brownies involved, I would use chocolate paper... and the rest, well, it was a team effort. Nothing really elegant about it, but hey... it did the trick! Stamps- assorted letters from different sets, none of them SU! Scalloped punch for the BITE! Chera, it was a great tag! I love it and how you decorated it! Hope you enjoy the rest of the A-Z tags. Thanks for participating!